Do you feel as though you need more living space in your home? The solution could be a basement multipurpose room. 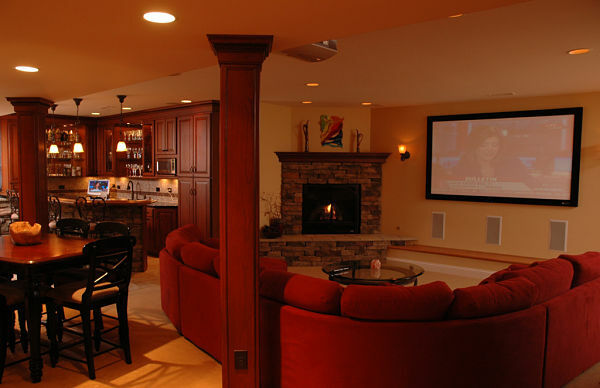 There was a time when basement remodels were primarily about creating space for hobbies, games or an extra TV room. The design was pretty simple and usually included wood paneling, suspended ceilings, fluorescent lights and linoleum. Today, however, basement remodels are seen as extensions of the upper level of a home to be used in many different ways. 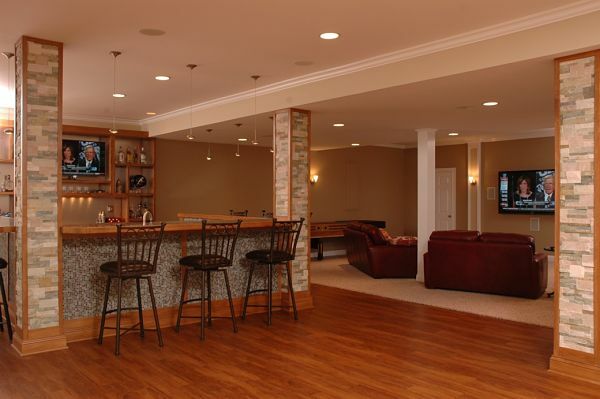 Here are some great ideas for converting your basement into the extra living space you need. 1. Kitchenette, media room, wine storage, home office and bathroom. A basement multipurpose room can be configured with activity areas. The owners of this home enjoy entertaining and gathering with family and friends. They also needed a quiet office space and an additional full bathroom. The basement remodel addressed all of these needs. 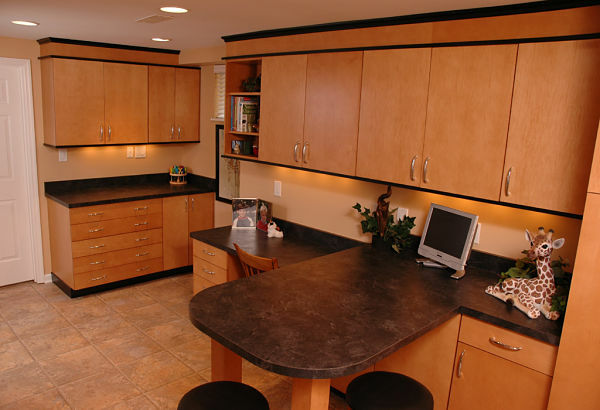 The open space of the basement was ideal for a kitchenette with a tiered bar, undercounter refrigerator, drawers, dishwasher and a small flat screen television. A microwave oven is used for warming and cooking. Cabinets were added for glassware, flatware and dishes. There is also a tall cabinet for pantry storage. The flooring is both carpet and ceramic tile. Tile was selected for areas where there may be spills or spatters from beverages or food and for a lower level bathroom. The media center includes a gas fireplace, projection big screen television and speakers built into the walls. Lights are controlled with dimmer switches. Pullout refrigerator drawers are used to store beverages and snacks. The counter area has many outlets for small appliances such as coffeemakers, crockpots and a blender. An undermount stainless steel bar sink, with a soap dispenser and a detachable gooseneck faucet, and a dishwasher make cleanup a breeze. Basements have irregular spaces and alcoves that can be used for closet storage, built-in cabinets and other purposes. The homeowners travel and enjoy wine. They created a “wine grotto” in an alcove with a wall mural reminiscent of trips to the vineyards of France and Italy. 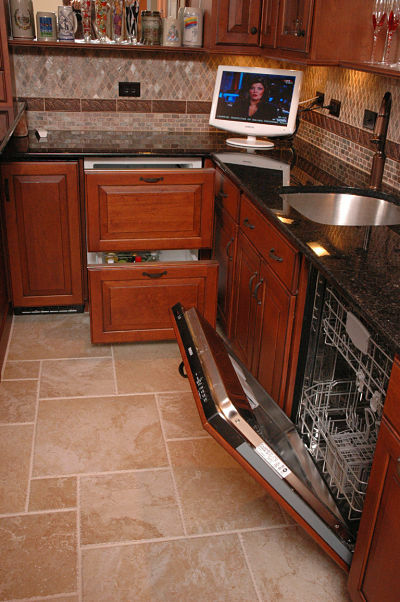 There is wall storage for wine bottles and a built-in a wine refrigerator. A home office was built into a corner of the basement and can be closed off with doors for privacy or to end a workday. There is workspace for two and built-in cabinetry for files, books, office supplies and computer equipment. 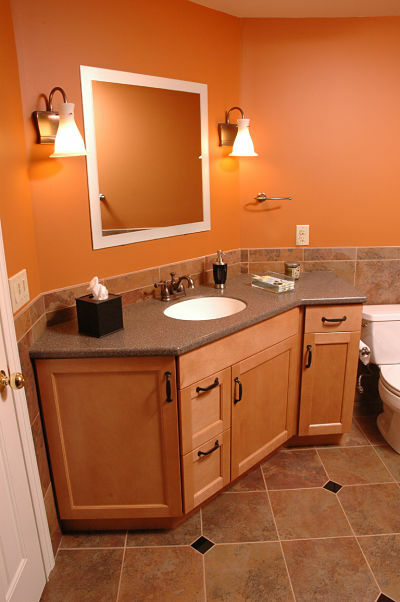 The lower level bathroom includes a large vanity for storage framed by wall tile. 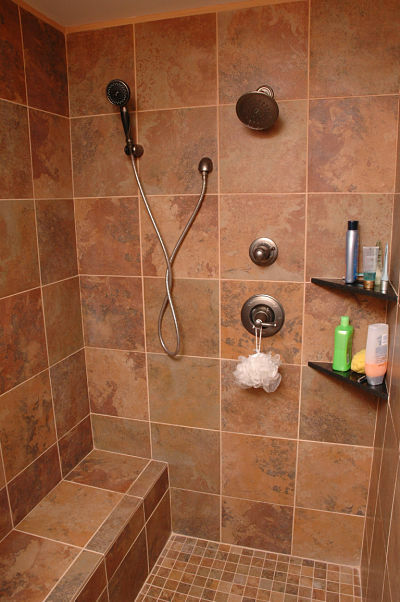 There is a walk-in shower without doors with a wall-mount showerhead, a handheld shower, a bench and wall shelves for shower essentials. 2. Sports bar, movies, games, collectibles and exercise gym. 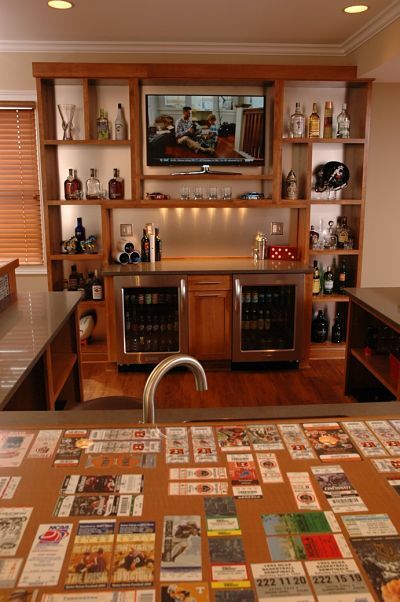 Basements have long been a retreat for men in many households, but everyone would love this sports bar, family room, game room and exercise room configuration. 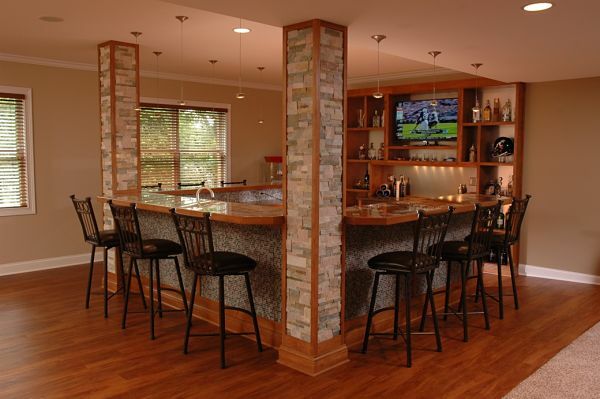 This is the ultimate sports bar complete with a wrap around counter, seating for nine and ample space for a host to serve his guests. Open shelving was constructed to hold spirits and frame a flat screen TV. 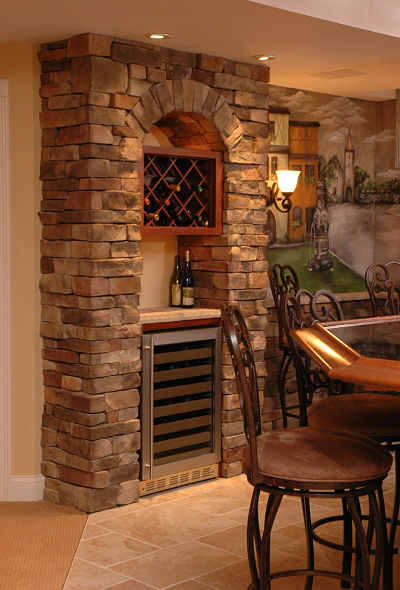 Stone-faced columns are an essential element in the “man-cave” décor. The custom shelving includes space for two below-the-counter beverage refrigerators and space to display sports memorabilia. The tiered bar features a custom counter that encases ticket stubs and programs from major sporting events. 3. Crafts, sewing, gift-wrap center, a home office and laundry. A basement can also be a retreat for women who need space for a home office and creativity. 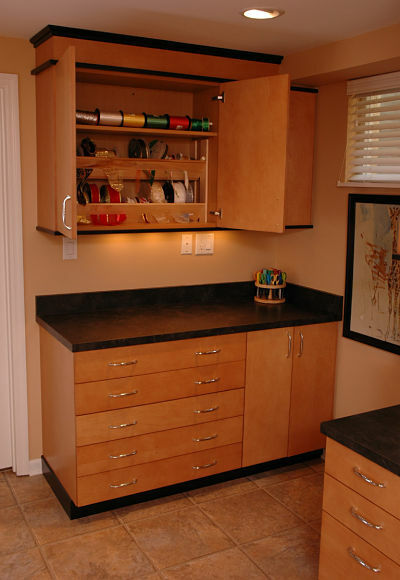 Built-in cabinets provide storage space for supplies. Laminate counters and tile floors are easy to clean after working on sewing or art projects. The design of this room also considered how it would be used, what would be stored and how items would be organized. For example, special inserts were installed in the cabinets for craft ribbons. 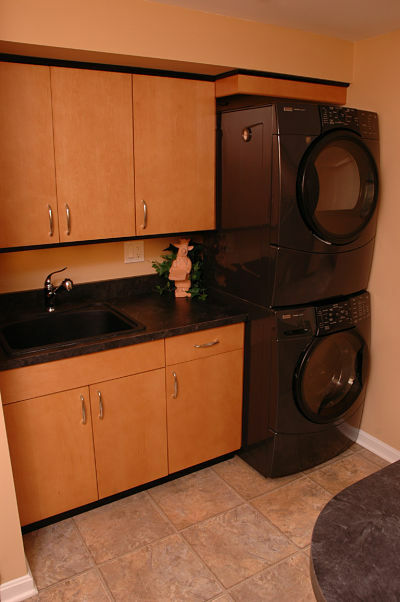 The space includes a sink for cleanup and doubles as a laundry room. The cabinets below the sink hold cleaning supplies. The counters can be used for sorting and folding clothes.